Um, sure, nice, overseas business trip is always interesting, but um, Germans need a visa for China. Dunno if I can get one so quickly, let’s try. So, on that same evening I asked the travel agent that we have to contractually use and they sent me necessary documents for Chinese visa application, which I started to fill out over the weekend. I’ve been to China several times before, first time was in 2001 as a tourist when I visited Beijing and Shanghai doing the classic stuffs of visiting the Forbidden City and so on. 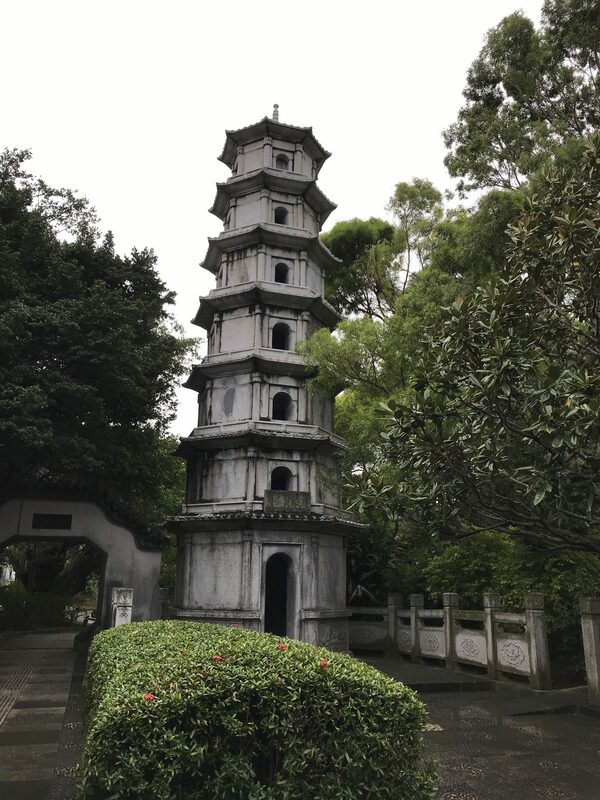 Ever since I have been on quite a number of business trips to China, once Beijing, all other times Shanghai, and I don’t even remember how often I’ve been to Shanghai. For my previous position I went to Shanghai regularly once or twice a year for a yearly conference and also some trainings. 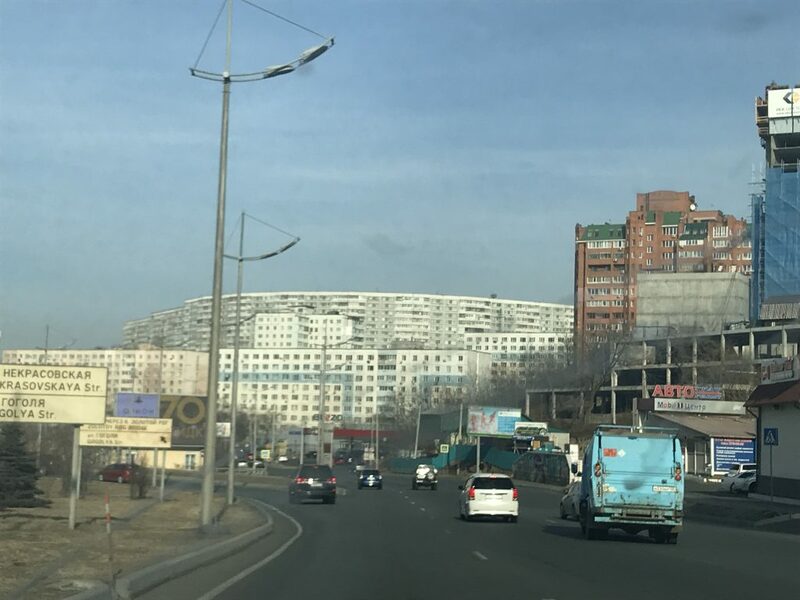 The one business trip I had to Beijing sticks out, since it was 2007, one year before the Olympics there and all the tourist street neighborhoods close to Tiananmen Square that I fondly remembered from 2001 were flattened and gone. But back to the visa. For the previous visits, I always had ample time for getting a visa and left going to the embassy to the travel agent. It’s also been four years since I last went to China and I forgot most of how the visa application works. This time, because time was so short, I eventually decided to go myself to the embassy, but before that I needed to get an invitation letter from our Chinese counterpart. Usually they want two weeks of lead time to issue such letters, I had two days. The travel agency sent me only a PDF sample of an invitation letter. Upon asking whether they have a word version of the thing, the answer was no. After begging the Chinese counterpart, they made their own invitation letter. I sent it to the travel agent for check and they said it’s unusable, why didn’t you use the WORD format? Which WORD format???? You guys sent me only a PDF and then said you have no WORD . Turns out they misunderstood… arghhh. They finally sent me a WORD format, which I sent to China and begged again to fill it out. I got the new invitation letter and went to the embassy in Tokyo on Wednesday the 3rd. The lady at the counter checks everything and says. Your passport number on the invitation letter is written wrongly, we cannot accept it. Ahhhhhhhhh! Two numbers were switched around and I didn’t notice, the travel agent who “checked” the document the night before didn’t notice. They told me I have to get a new invitation letter, but at least they allowed me to fax it to them instead of coming in once more. So I rushed back to the office and begged the Chinese counterpart to issue yet a new letter. After much begging I got the third version of the invitation letter, which needed to be stamped and signed by a director, and faxed it to the embassy. They accepted it and promised to have the visa ready on Monday morning, one day before I was supposed to fly. I find it extremely fascinating why Japanese nationals don’t need a visa to China (if they stay under two weeks). 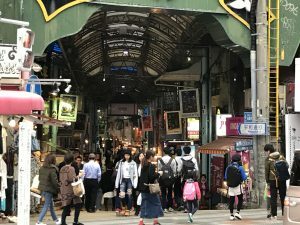 Chinese nationals always need visas to Japan. Why are the Chinese not returning the “favor” and let the Japanese into their country without a visa? Why do Germans need a visa? Anyway, another page gone in my passport now 😉 and I wrote this while sitting on the plane to Yantai. All the Russian fans told me I should look out for the band because they would surely be staying in the same hotel as I did. So in the morning I did keep a look out at breakfast but nobody was there. I later found out that the poor guys must have left much much earlier than when I sat at breakfast at 9:30. 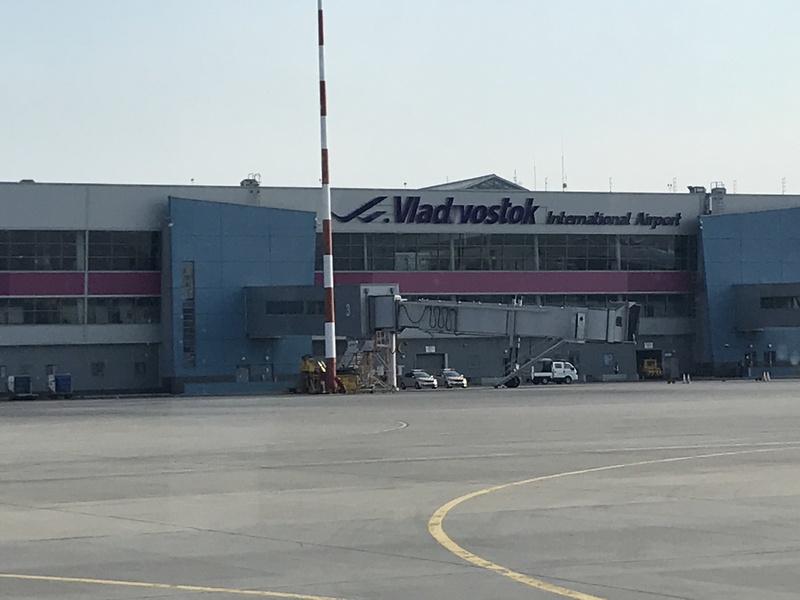 They were going to Novosibirsk next and when I got to the airport myself the next day I saw that the flight to Novosibirsk left at 8:50. Uh… that means being at the airport before 7:30 surely. I suppose they left the hotel at 6:30 or something like that! So much for tour live. 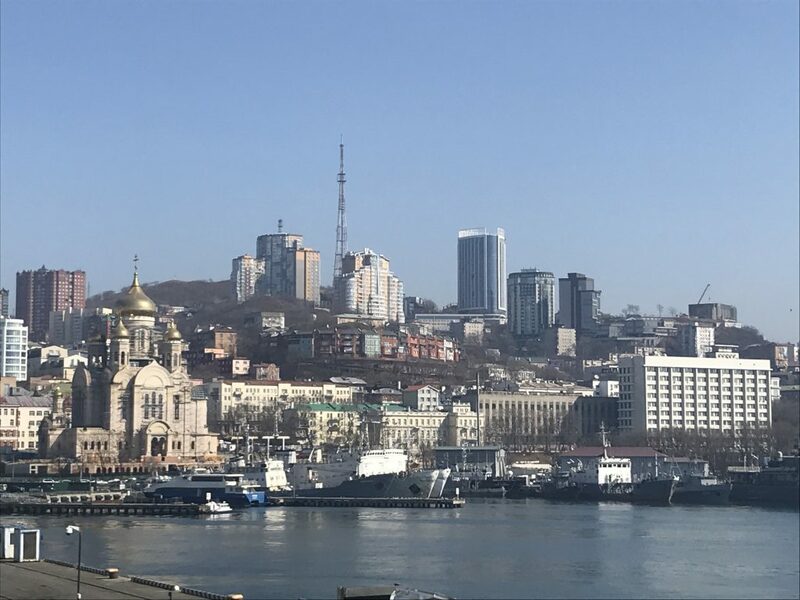 Since the Amon Amarth fan lady, just let me call her AA, promised to pick me up at 14:00, I wandered around some more, found a nice spot for a Vladivostok skyline picture and also found two more shopping centers, slowly finding out what looks like a shopping center and what not. I confirmed already the day before that the Chinese and Koreans are coming for shopping. 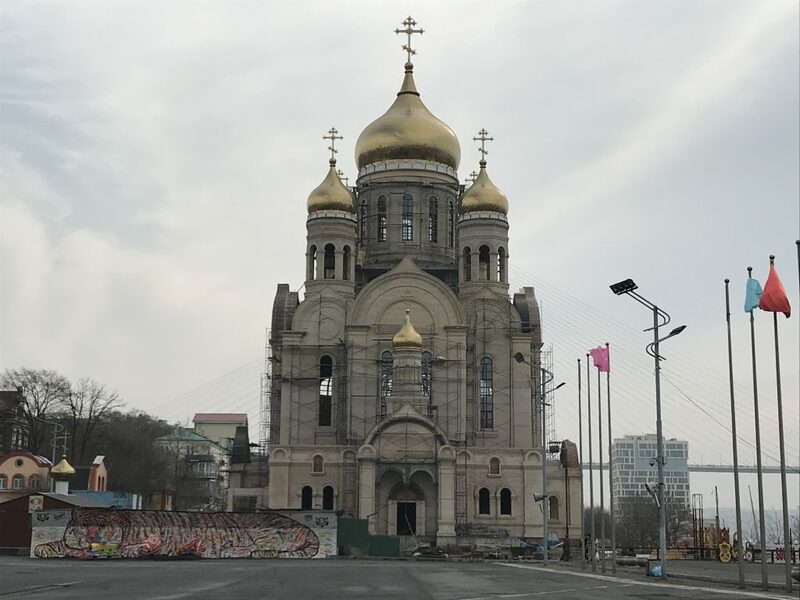 The rubel is apparently quite low these days, prices in Vladivostok are lower than in Korea for sure and apparently it’s even becoming attractive for Chinese mass tourism. 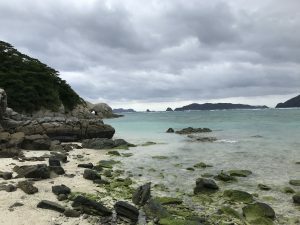 AA also told me that the Koreans and Chinese don’t need Russian visas for Vladivostok and she does not need one either if she wanted to go there. It’s some special agreement for the Russian Far East as well as some areas in China close to the border. If they want to go to Moscow they need visas, but not for the Far East. Interesting, I didn’t know that. I bought some souvenirs and then waited for AA at the hotel. 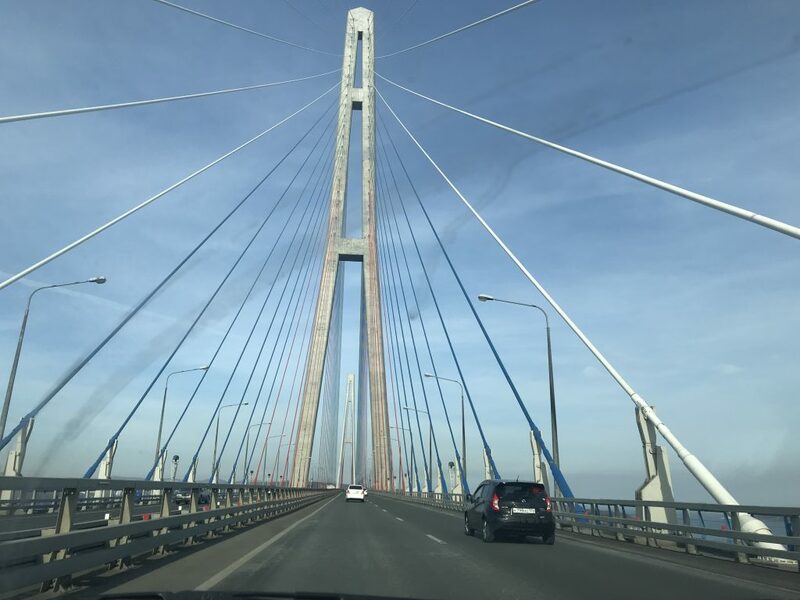 She was very punctual and then we drove off towards Russky island over the impressive two bridges. At some point the asphalt road ends on Russky island and the adventure begins. We were not the only ones on the dirt path, it felt like a caravan at times. AA said this is nothing yet, in the summer there is traffic jam at these dirt paths! 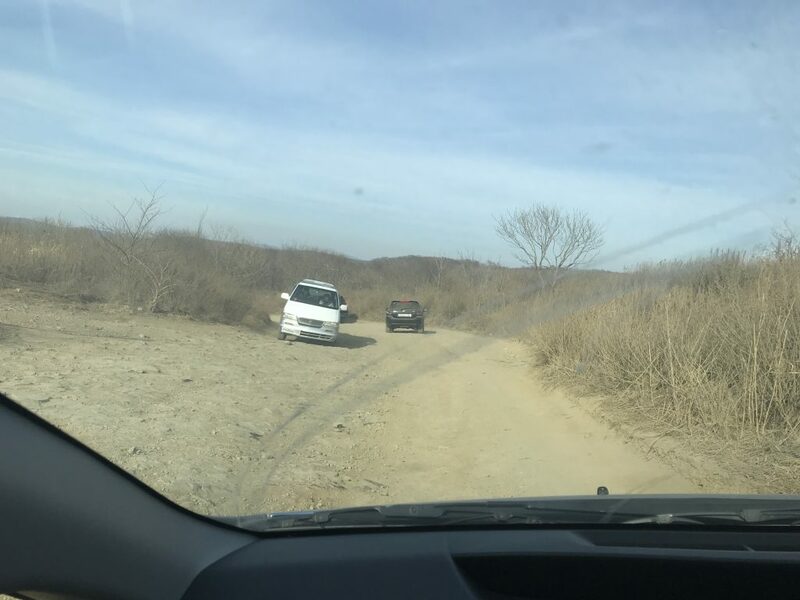 There are several “parking” areas and we stopped at one with a beach and where a hiking trail starts to a scenic spot. I was totally amazed by the amount of people there. Well, it was Sunday, but nevertheless. 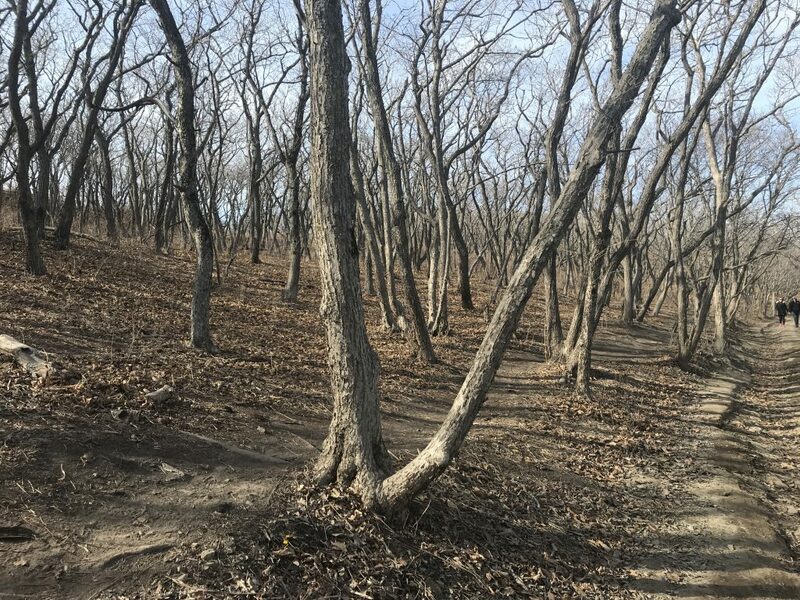 Much of the area is wooded, but was extremely dry and also dusty, it has been a super dry winter with not much snow even. There was actually a small bush fire a hundred meters away at one point. AA said the best time is in summer of course, when people go swimming at these beaches but also September and October, when the leaves change color. We had a great walk and the last cliff looked really beautiful. I thoroughly enjoyed this unexpected adventure, that I never would have been able to do without a local and AA drove me all the way back to the hotel again. Very cool addition to an already great trip. To say goodbye to the place, I went down to the shore once more and was in for another treat. 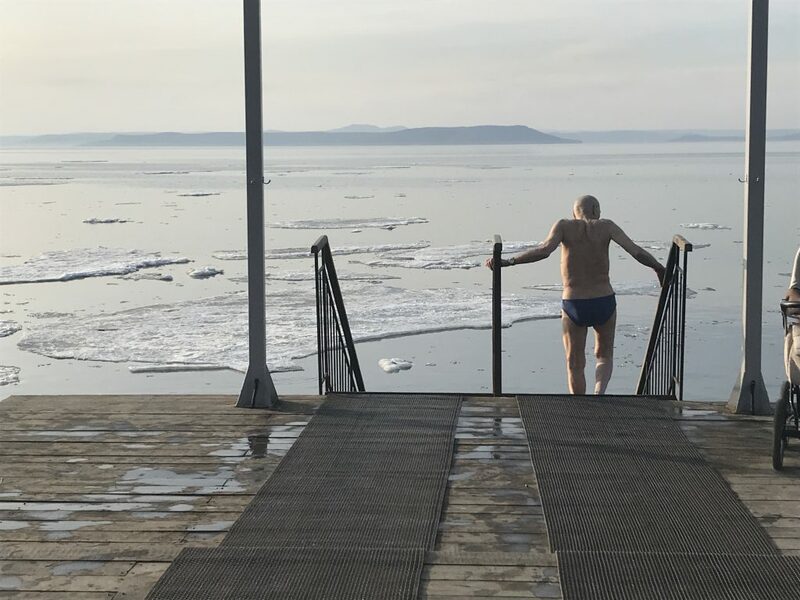 There were several elderly men who were actually, one after the other, taking a swim in the ice cold ocean!!! Kyaaaaaaa. 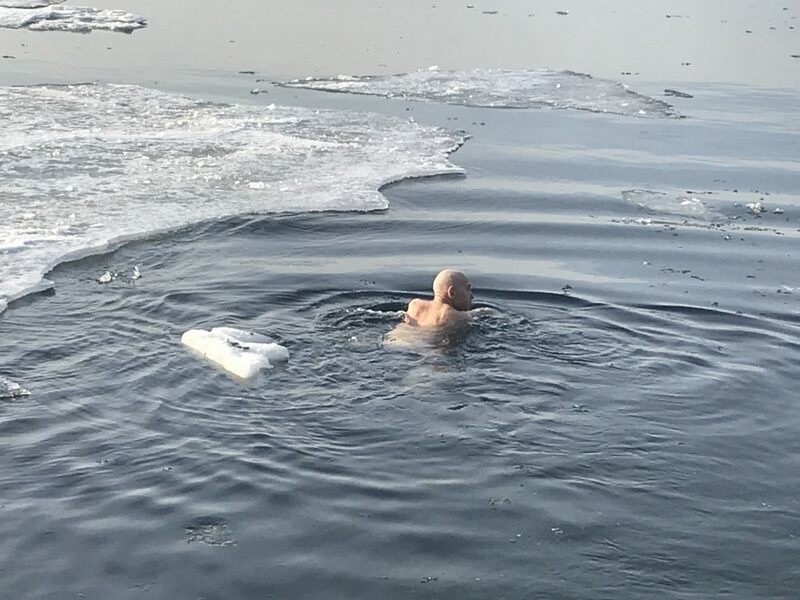 I was walking around in arctic gear, these guys, jump into the ocean! Air temperature was around zero Celsius and water temperature… well look at the floating ice! OMG!!! It was my second time to Russia and both times I made nothing but good experiences. I thought also in St. Petersburg and Moscow that people were friendly, but I must give it to Vladivostok that people there were even more friendly than in the big cities. There was not one moment where I would have felt unsafe, despite the adventures in finding the concert venue. Okay, there was a shady “taxi driver” hanging around the hotel who kept on asking me if I need a ride every time I left the hotel. But even he never got rude or too close. There was less police and military around than in Moscow and St. Petersburg. There is of course also less to see than in those two big cities, since after all Vladivostok is a mere 160 years old. I wonder since when there are direct flights from Tokyo and how long they will keep those up. On the way to Vladivostok there were maybe 60 people on board, on the way back 40 people. 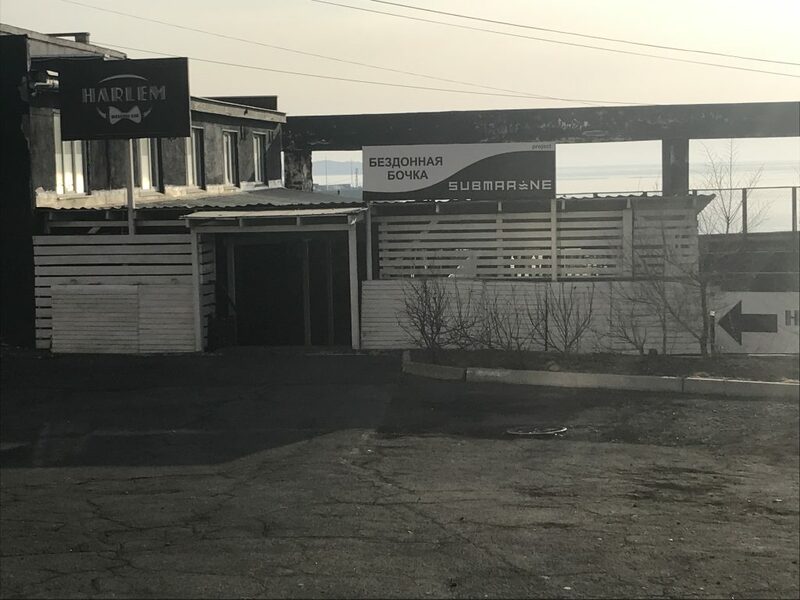 On the Amorphis website it read that the Vladivostok venue was called San Remo, apparently a hotel. On the ticket I somehow bought online the venue read Submarine Club. Hm. I asked at my hotel lobby, and the guy did not speak English too well. For standard questions he could somehow answer in English, but not such non-standard stuff like whether the Submarine Club is maybe inside San Remo. He pointed vaguely into the right direction and I thought oh, heck, I’m gonna find it somehow and went looking. It said 19:00 on the paper. I was not sure whether that meant concert start or start of letting you into the hall and the hotel guy couldn’t tell me either because of lack of English. So I went looking for the venue at 17:30 and good that I did so. At a sign which read San Remo, I actually ran into the two guitarists of the band and quickly addressed them and told them I’d see them later, they greeted nicely back, then walked down the road. Good, so it had to be around here somewhere if the band members are close! I ventured into a spooky alley and ended at a nightclub, all right, but it had another name, and the door was closed, nobody there. Some shifty looking dude wearing an indistinct hoody came out of a side door and I showed him my print out and asked where the venue is. No English really, he said, niet niet, and pointed up and right. Hm. 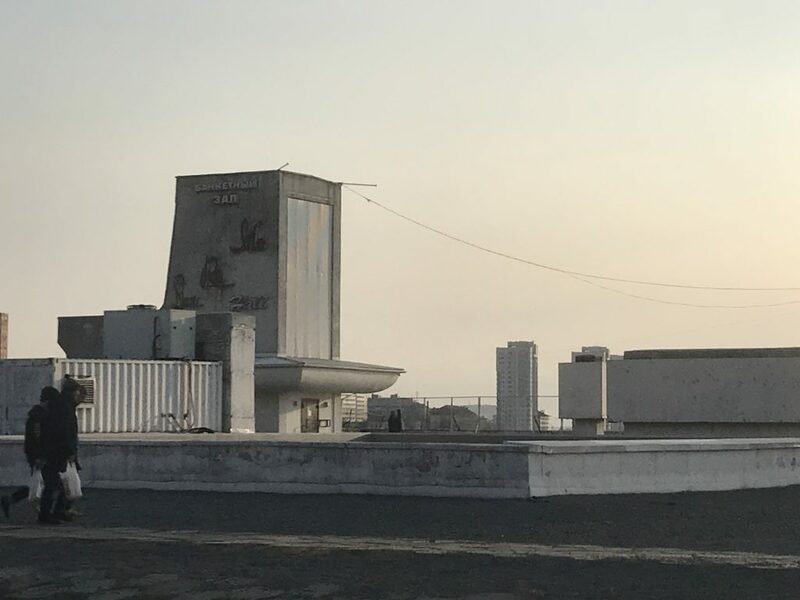 So I went up and right and landed on the roof of the San Remo building. It’s built kind of into a hill and you could easily walk onto the roof. some youngsters hung out there, but they didn’t look like heavy metal fans and were too young also. One kid walked into the roof access of whatever was beneath it and I thought, what the heck and followed him. I ended in the seventh floor lobby of a super old style hotel way beyond its prime. Everything screamed seventies and that in Russian. At the reception I asked the lone lady present if she spoke English. A little. I showed her my paper and she was going, Hu? Never heard of it kind of “Hu”. She went into the office, asked someone, then came back. Go down and left. Hm. I went down with the elevator to the first floor, nothing but a shady restaurant. Outside of the building to the left, closed doors, no metal fans. Damnit, it must be here somewhere, even the band members were around. Under normal circumstances I never ever would have gone near such night clubs, shady hotels and run down buildings! Lol. But there I was wandering, feeling like in a Russian spy movie. I decided to walk around the complex and went up the hill again outside of the building. And there! 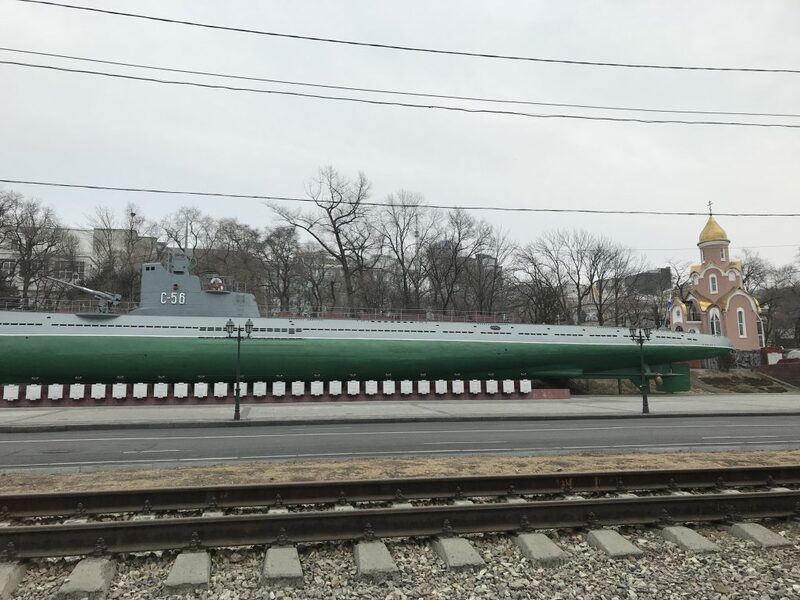 In a corner, next to a bar, “Submarine”! Yeah! And there were a few heavy metal looking dudes around! I approached them and felt safe, ladies and gentlemen. To “normal people” Russian dudes in leather, with long hair, beards, whatever chains dangling from their clothes look scary. But I felt right at home, lol. I said “hi” and they immediately noticed I’m not Russian and there were actually three, four guys and girls who spoke English and immediately questions started, where the hell are you from? You came to Vladivostok for metal? Oh man! So cool! One girl had been to Europe several times, going to Amon Amarth gigs, so much appreciating I bothered to fly to Vladivostok. They were all super nice and friendly and we are all one big heavy metal family where it does not matter where you come from. The girl who had been to Europe and I exchanged social media stuff and then she offered to drive me to Russky island the next day so that I see some more of her home town. What? Seriously? Yes, yes, no problem! Wow! With the promise to pick me up at 14:00 the next day, we were finally allowed into the venue and since I had been early, I managed to get first row together with the other early birds. While waiting we talked about metal of course, but also the weather for example. 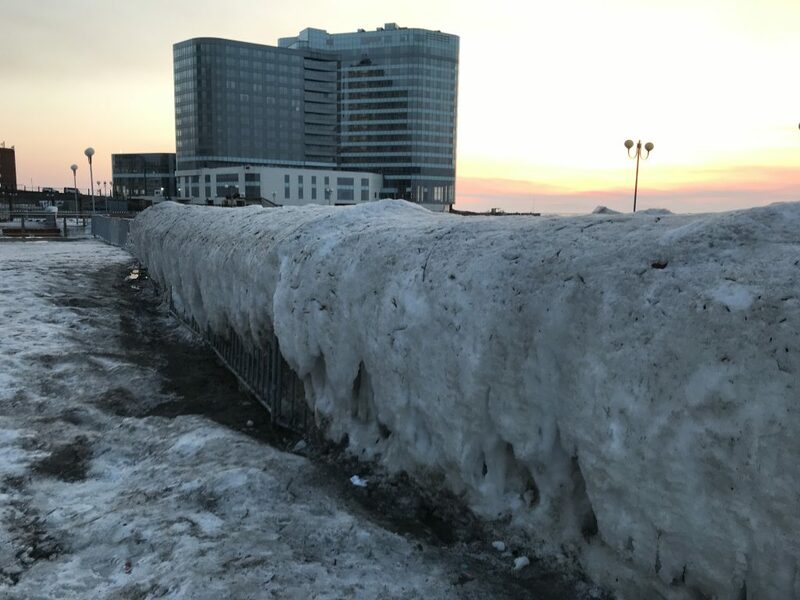 It’s been the warmest winter ever they said, usually in March the west side of the bay is still frozen solid and not only a little bit, zero degrees is so warm! Okay. It’s all a matter of perspective. One of the guys said, he hates winter. Uh! A Russian who hates winter! I asked another guy whether he can recommend a vodka brand to me. I wanted to buy one bottle at the airport duty free before I leave. Hm, he doesn’t drink vodka and has no clue about the stuff! There go your stereotypes! He doesn’t drink even a beer before a gig, he wants to be in full capacity of his senses to enjoy the music. Yep, same here! One guy works for Mazda, another for Carl Zeiss, the Russky island lady and her husband are both programmers. 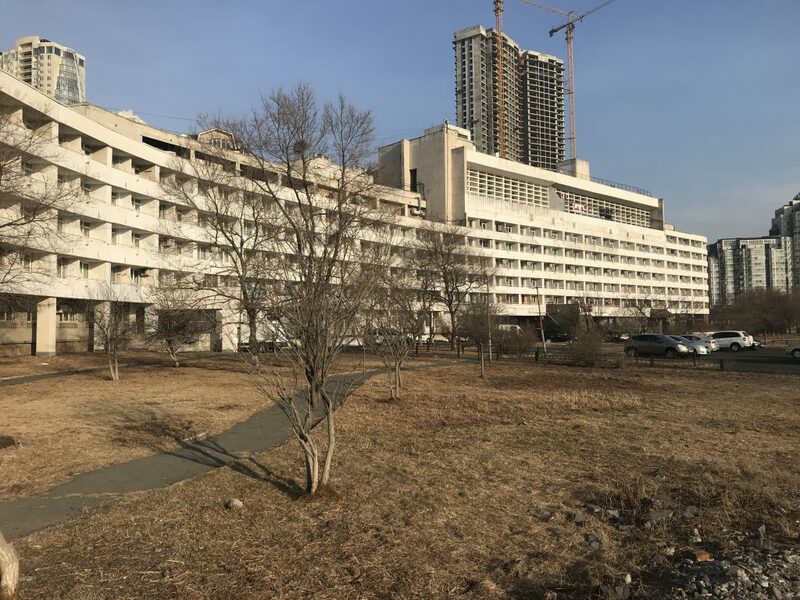 First impression of the town was gray, cold, pre-fabricated high-rise buildings from the seventies. My hotel was nice though, nothing special, but all the international standards available that a hotel is supposed to have. The room looked out over the western half of the bay and there was ice floating at the shore. I ventured down to the shore and checked out the ice. 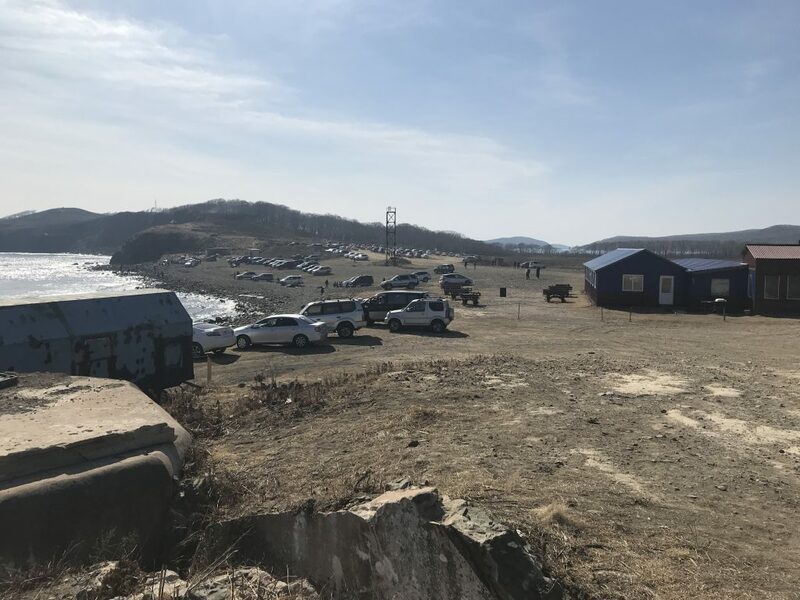 Half the shore was a construction site, but people walked through the fences, taking a stroll, as if that was all very normal. The constructions sites were around two defunct buildings from the sixties maybe and made the impression on me as if they were permanent. I had chosen my hotel strategically close to the venue of the concert and already found the place on that first stroll, or so I thought at the time, and was quite relaxed about that, eating dinner at the hotel’s restaurant before going to bed. The first day of exploring: I walked down to the shore again, this time venturing further towards an amusement park by the yacht harbor. All the facilities looked very much seventies or eighties to me. From there I walked through town for about five hours with a short break for a late lunch and checked out most of the sights of the city. The big cathedral at the central square was unfortunately closed do to repair. 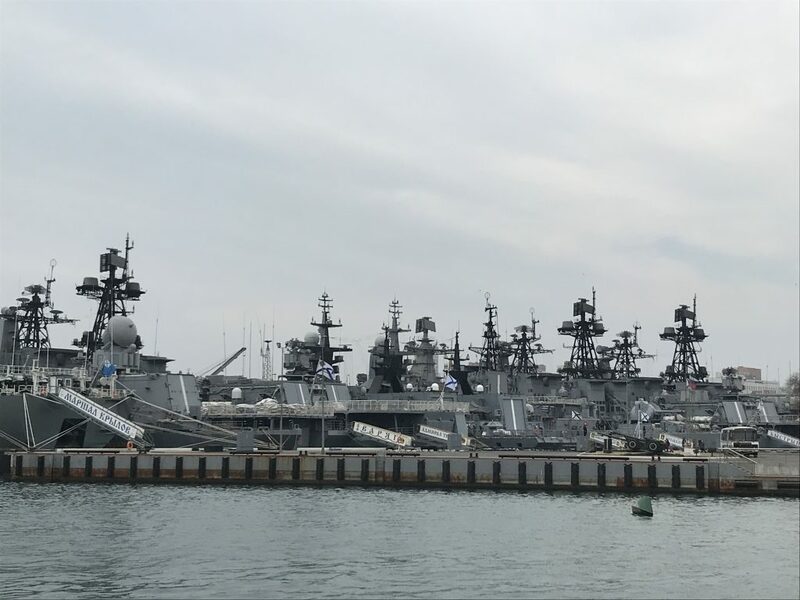 I counted 12 military ships in the harbor and their radar etc. masts looked like a collection of alien space ships to me. Much like in Moscow and St. Petersburg the Second World War is quite present still in every day Russia. War memorials and eternal flames and an old submarine exhibit take you back seventy years. The submarine was interesting though, a museum part and then a “live” part where you have to squeeze through bulk heads. Then I got a bit lost on the search for the mini funicular promised in a Vladivostok walking map I got at the WW2 submarine. I walked too far as it turned out, but stumbled across more tanks and war stuff in a park. Finally I found the funicular. It’s a two minute ride only up the hill which costs 14 rubles, which is some 30 yen. On top was a closed viewpoint but the sight over the city was okay from the side of the funicular also. 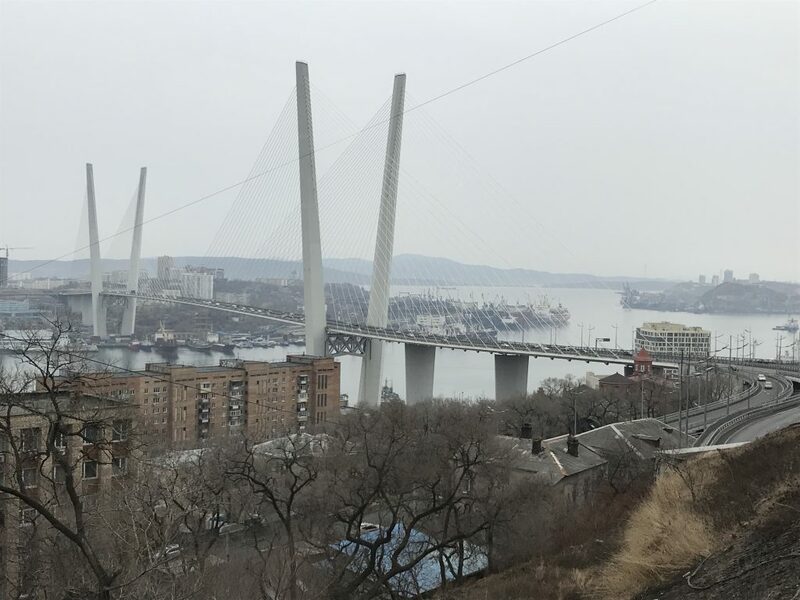 Apart from long distance trains the funicular is the only railway inside of Vladivostok, all public transport happens via buses. Those buses look old and they blast a lot of unfiltered exhaust into the air. I did everything on foot, which is okay though, since the downtown area is not that big after all. Nowadays Vladivostok has about 600,000 inhabitants. Funny thing was that I had difficulties recognizing shopping centers for what they were. Due to the cold they don’t have open inviting big entrances but there is a glass door somewhere, which leads into a foyer and then another glass door, all in the attempt to keep out the weather. I luckily found one shopping center where I could buy some fast food lunch by pointing at pictures. Public rest rooms are also a rarity and shopping centers are your best bet for that. 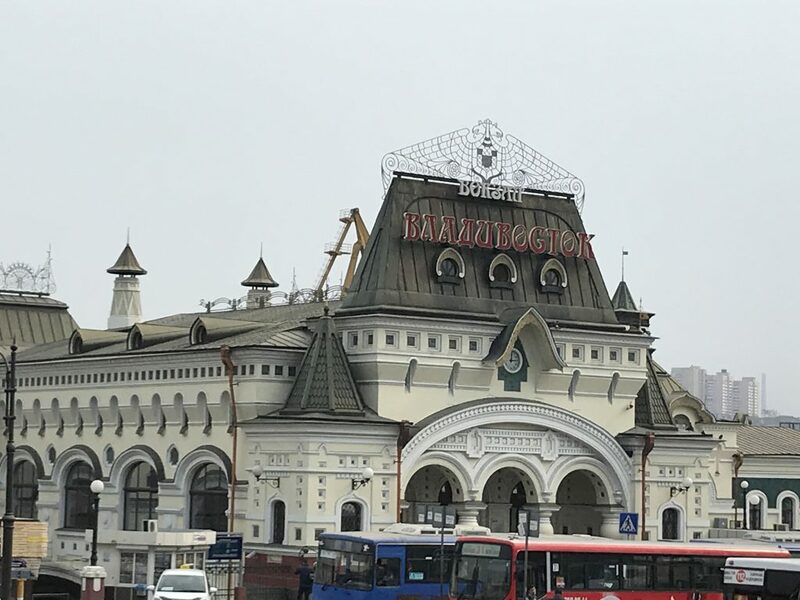 Then I walked back to the hotel past the Vladivostok railway station. It is still a dream of mine to ride the trans Siberian railway from Moscow to Vladivostok or the other way round one day. Without getting off in between it takes seven days. Well, let’s see! At least I was now on either end of the tracks 🙂 After a rest in the hotel I readied myself for heavy metal! Vladivostok is surely not the most common and easiest to get to holiday destination, which is a shame actually. I thoroughly enjoyed my short journey there. 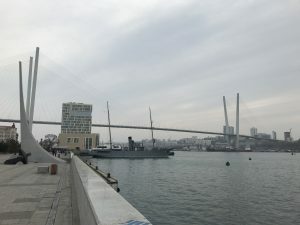 A few things about Vladivostok before the details of my trip. Vladivostok was a Chinese fishing village called Haishenwai, before the Russians seized it in 1860. China was weakened from the opium wars and didn’t oppose Russia seizing that frigid port to the north. 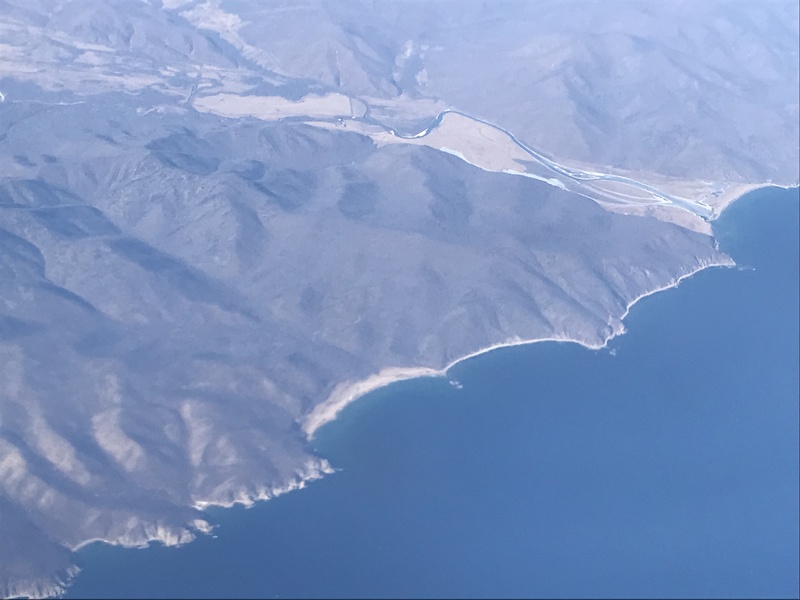 The Russians renamed it Vladivostok and quickly developed the place to make it theirs for everyone around to see and brought people there. Nowadays more or less zero Asians are residents of Vladivostok, if in a way they partially claimed it back, but more about that later. Even though Vladivostok is on the same latitude as Sapporo or the island of Corsica in the Mediterranean (! ), winters are brutal and the ocean around it freezes. Vladivostok lies on a peninsula that sticks out into a large bay. There is ocean on three sides of the town, and, as mentioned much of the quiet bay freezes over in winter. 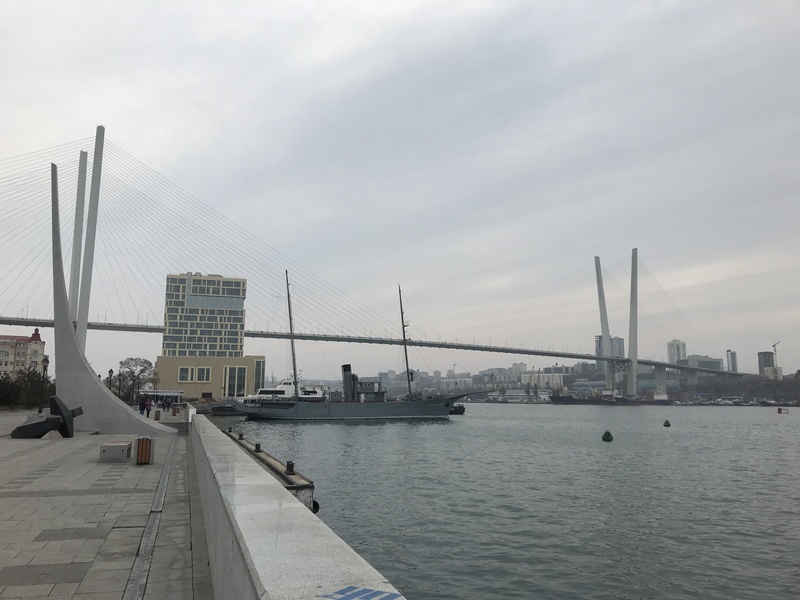 During Cold War times, Vladivostok was closed to foreigners, since it was and is the one and only big harbor for whatever Russian naval military forces. I wonder what life was like in Vladivostok during these dark times. The town saw a major development boost when the APEC summit was held there in 2012. 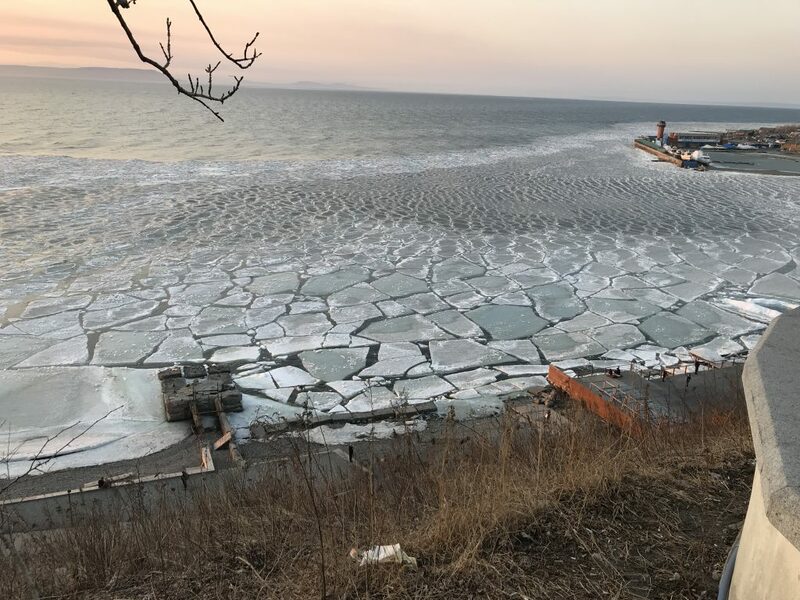 They got the two big bridges connecting parts of the city and the city to the island of Russky in the south of Vladivostok. Before the bridges you had to drive around a big part of the inner bay and go by boat to Russky island or rather don’t go there at all. They also built a giant convention center and university on Russky island and a big aquarium. 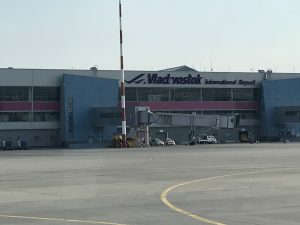 So, why go to Vladivostok? People who know me know that it’s one of my passions to travel and to combine that if ever possible with going to gigs of heavy metal bands. 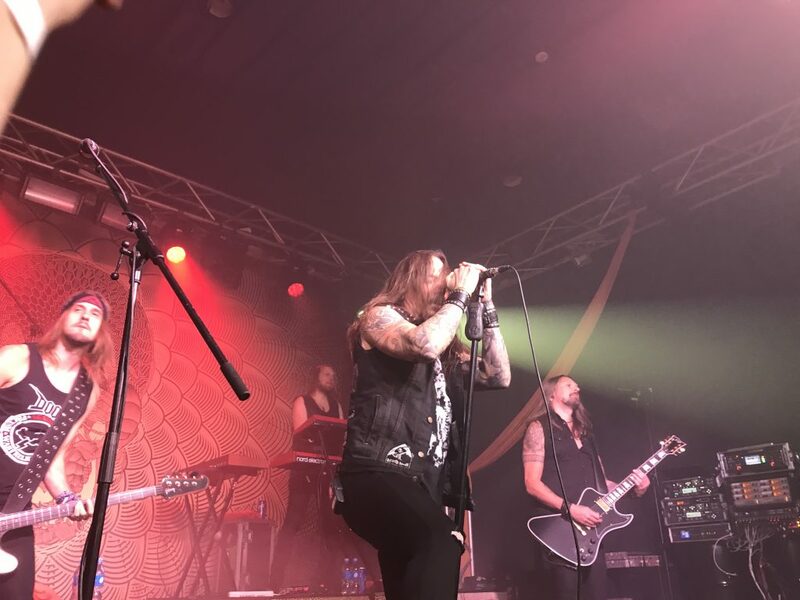 It came to pass that one of my favorite bands, Amorphis from Finland, was going to Vladivostok. Ha! 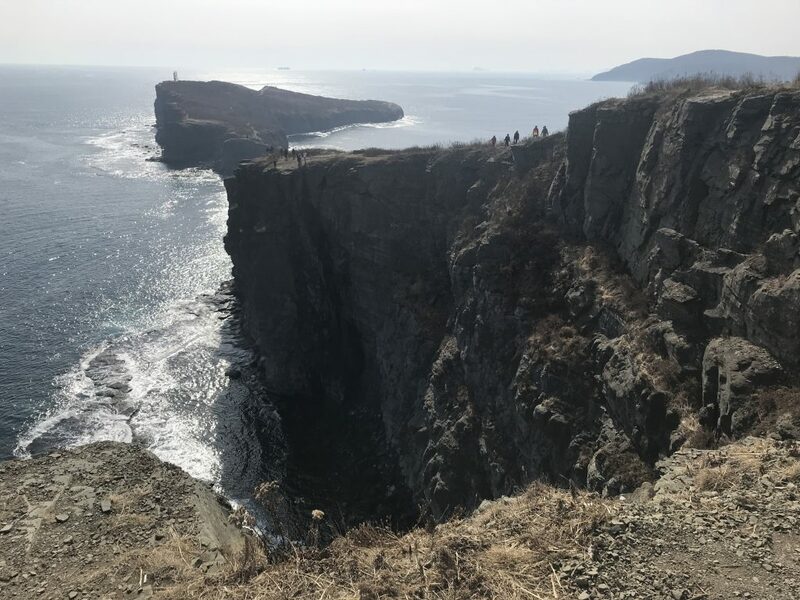 That sounds like an adventure worth undertaking 😉 Since after all, Vladivostok is just a two hour twenty minute plane ride from Tokyo. To get a Russian visa is the biggest hustle about going to Russia, but also that is manageable, if super inconvenient. I must admit I was quite excited about the trip, not knowing at all how much remoteness to expect. 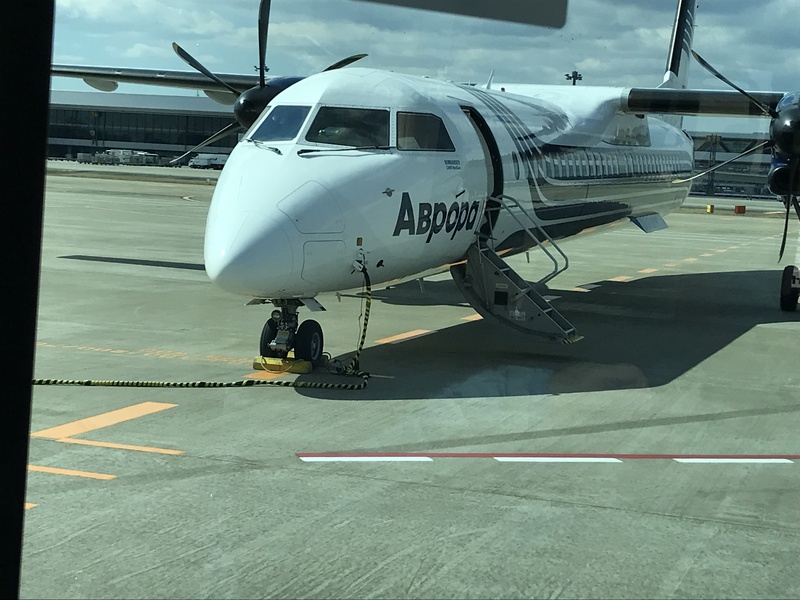 I was not majorly encouraged by the tiny propeller plane of Aurora airlines, the Far East subsidiary of Aeroflot, at Narita airport either. Though, thanks to okay weather, the flight was smoother than expected. I think about 80 people fit onto such a plane and there were maybe fifty or sixty heading for Vladivostok. Some Japanese adventurers, but mostly Russians. 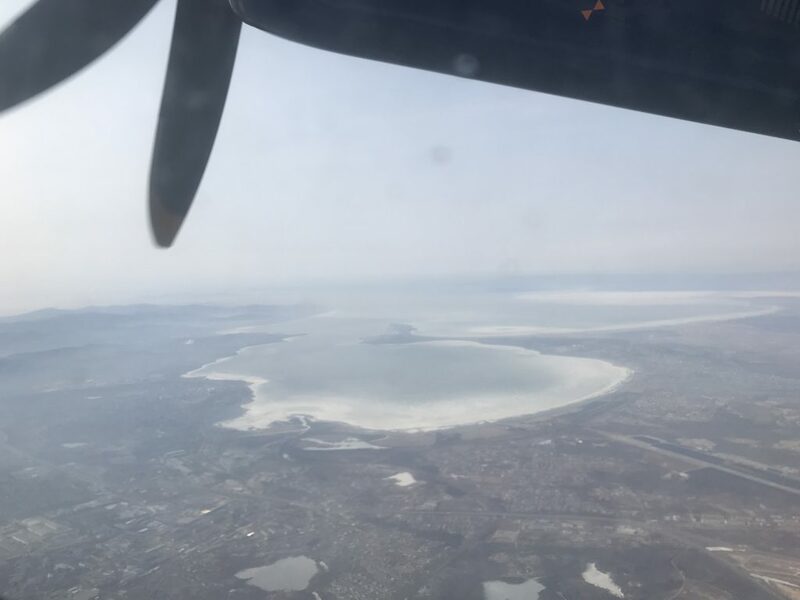 Arrived in Vladivostok though I was in for a surprise. The airport immigration was swamped with plane loads full of Chinese and Koreans. Uh? 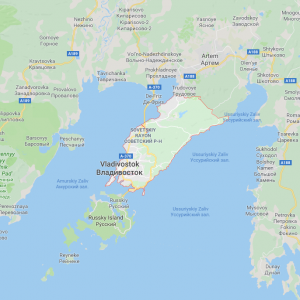 What to they want in Vladivostok? My first hunch was shopping and my hunch got verified later. I shall come back to that. They let me into the country thanks to my visa no questions asked. I waited forever at the baggage claim until I came upon the idea to walk around because some suitcases fell of the band once in a while and yes, mine must have fallen too and I found it at the farthest, darkest corner of the baggage retrieval. 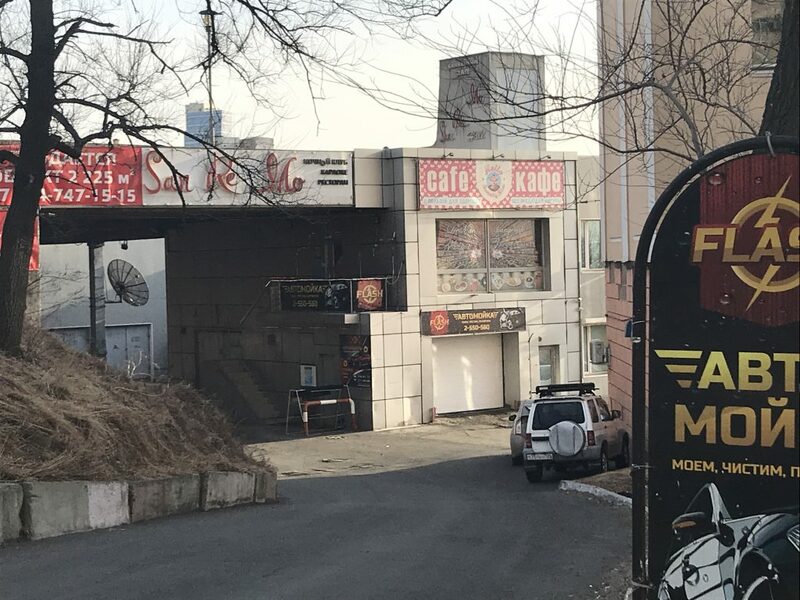 I had ordered a taxi via my hotel and they were supposed to pick me up with a sign stating the hotel name, but there were only tons of Korean signs and none in western writing. I happened to arrive though, luckily, on the international women’s day, which is even a national holiday in Russia, and people were giving all women who arrived tulips at the arrivals area. I went to the side and stood there waiting and got out my phone to call the hotel, as one of the young women who gave out flowers asked me if she could help in very good English. I explained and she whipped out her phone, called the hotel and ran through half the airport for me searching for my driver, apologizing that he must be stupid and that I have to wait. Wow, so friendly! She did ask though, what are you doing in Vladivostok, with the undertone of ‘why the hell have you come here’? Lol. I explained to her about the gig and she said she’ll check out the band! Lol. Then she found my driver and off I went towards Vladivostok which is about an hour drive away from the airport. 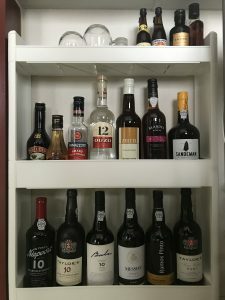 I’ve always liked port wine, but especially since I’ve been to the center of the port wine world, Porto itself, in 2015. 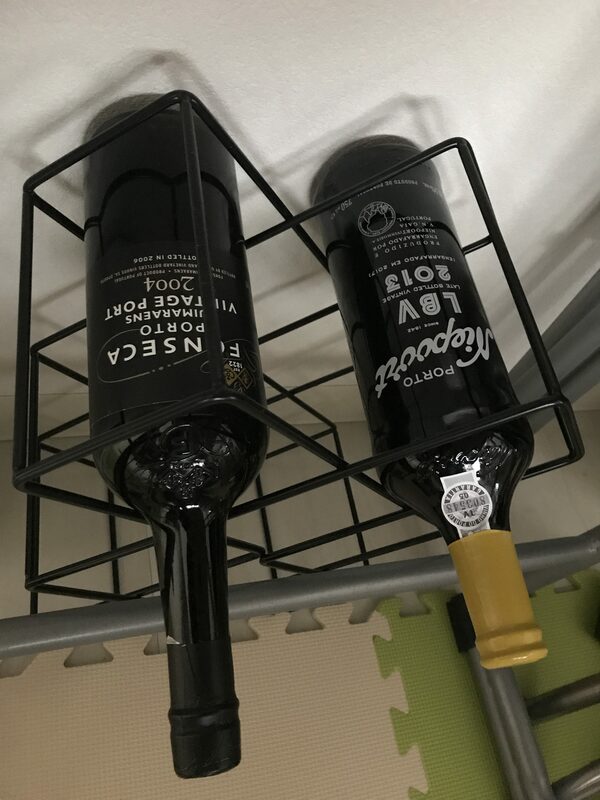 I’ve always had one or the other bottle of port wine in the house since a couple of years already. One shop in Shibuya carries Niepoort, another shop at Tokyo station has Taylor’s, a shop in Shin-Yokohama has Ramos Pinto. Another shop close to Yokohama station carries Taylor’s as well. The 2004 Fonseca vintage I have for quite a while already and I’m planning to drink it for a special occasion ;-), the Messias and Bulas I bought online. I am quite amazed that you can actually find so much port in Japan when you go looking for it 😉 You will also notice if you know something about port that I have a preference for tawny port 😉 The three bottles with a 10 on it designate 10 year old tawny. 🙂 But of course I’m not saying no to any other form of port. (The main variants of port are ruby (stored in metal tanks before bottling), tawny (stored in wooden barrels before bottling), white, vintage and LBV (late bottled vintage). There is also rose and reserve as variations of ruby, but I never had either of those yet and haven’t found them in Japan). While I have a preference for tawny port, I have not yet crowned a personal favorite brand. 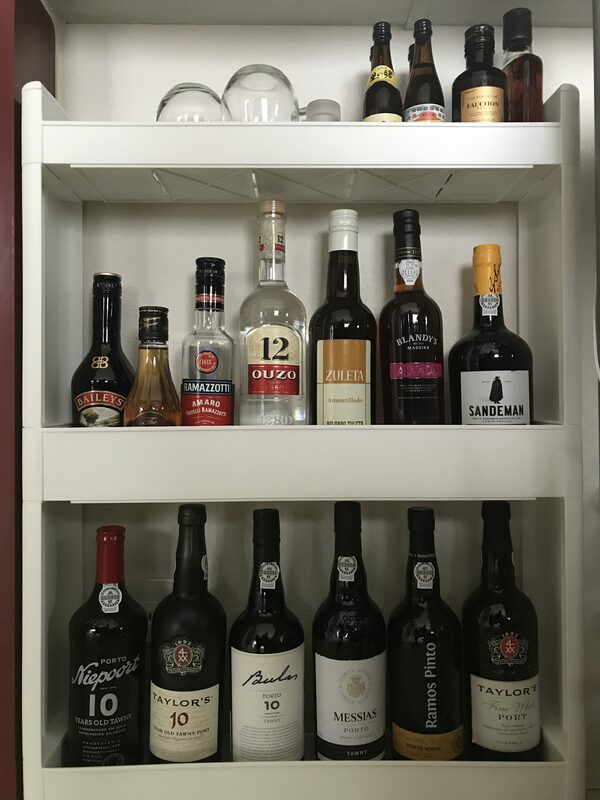 I’ve come to like my little bar and the port hunting trips and shall indulge myself now and then with my half glass of port in the evening. And one day I shall return to Porto and not only visit the town again but also make a tour down the precious Douro valley where the stuff hails from. I am deliberately not using the phrase “social responsibility” in the title and throughout this blog entry, because the story has only partially something to do with the well known “corporate social responsibility” or CSR. I mean something different with the “social task” and here is what. The story happened quite a couple of years ago, when I still did some sort of marketing for some division of the company I work for, which included organizing our booths on trade fairs. I am no engineer whatsoever, I studied Japanese studies, English literature and dramatics… however, we had two machines on that booth, one was doing task A and another was doing task B as a consequence of what happened at machine A. I told our assembly factory so and they sent me a drawing with the two machines on the booth, but alas, without a connection between them (a conveyor belt). I picked up the phone and asked the guy in the factory who made the drawing, how the heck the product was supposed to get from machine A into machine B without a conveyor belt between them. I simply couldn’t believe this amount of stupidity. At next opportunity, I showed the NG (no good) drawing to the factory manager and complained heartily about the lack of a conveyor belt and the lack of basic intelligence. All my anger puffed away and I could do nothing but laugh. Ever since, this sentence is kind of a guiding star for me and I’m trying to remind myself of it whenever I encounter complete dumbness in the company. Unfortunately, my patience is being tested again recently. We have not only one, but two dudes in the office who are completely useless and cause nothing but anger and frustration to everyone who has to work with them. Nobody is giving them tasks anymore, because it is really better, faster and easier if you do it yourself or ask someone else, than to try to get these two dudes of corporate horror to perform any sort of meaningful work. The worst thing about that is that one of them is even a manager and everyone around him asks him/herself who the hell made this loser a manager and why. I’ve “hated” sports all my life. I hated school sports from the bottom of my heart and used every excuse I could find not to go. My parents “forced” me to do some sports, at first I did gymnastics, terrible. Then I did basketball for a while, next I did fencing for a few years. While fencing was kinda interesting, what a hustle with all that equipment. My dad dragged me ice skating on weekends for some time. During some summer camp I did tennis for a few weeks. Nothing ever “hooked” me, nothing. I always cursed the time wasted with sports, during which I could have read a book, or written a story, or watched a movie. Then I left home and went to university and felt the obligation to do some sports for “health” reasons and because sports is something everyone does. I tried Kendo, Teakwondo, Aikido and horse back riding. I never lasted anywhere longer than half a year. When I entered the work force, I simply gave up on any sports. The only thing I did ever since I have a job is riding my bicycle. Not a fancy race or mountain bike, mind, but a “mama chari” as the Japanese call it, a normal city bicycle with a basket for your luggage. Even with the bicycle, I must have a “reason” to ride. The reason is either commuting to the train station or on the weekends doing whatever grocery or drug store or other shopping. I have great difficulties doing a bicycle ride if there is “no reward” or “no purpose”, the purpose being commute or shopping. But, alas, we’re not getting younger and I have trouble with my back for ten years already and now I have finally reached the point of “I gotta do something” for my health and somehow move those stiffening joints. For a year or so now I am doing daily back stretching exercises for fifteen minutes in the evening before going to bed, but that’s not enough anymore and I have the feeling I need to do more. So, new year resolution for 2019 was “go to yoga or Pilates or something”. I managed to activate a work colleague and together we checked the Internet for a yoga studio close to work and oh miracle, we actually found a place one minute from the office. I think we were very lucky with the place. It’s a super clean and modern women only studio and they offer yoga as well as Pilates and also have a room with a workout machine circuit. The yoga trial class we went to was excellent. I immediately liked the trainer lady. So I became a member of the studio and have already done three weeks of yoga (once a week) and one Pilates session (which was not such a hit. In the session we used the so called “spine corrector” and the prop was too small for my non-Japanese height). Last week, we also got an instruction session for the workout machines. I have never been to a gym yet, haha! I’m not sure whether I will use those machines a lot, but the yoga sessions I am wildly determined to continue. I truly hope that my back problems will get a bit better thanks to this. Maybe I should have started ten years ago, but sports and I, that’s like oil and water! 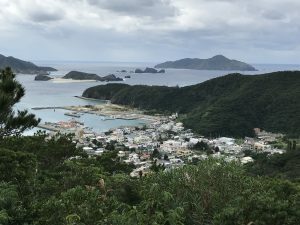 On day three I did the lookout route and burned through two bicycle batteries on the up and down course through the island (I got a second one as a spare from the hotel staff as a service ;-)). One of the open sea side lookouts comes with a mini tower for the whale watching season. 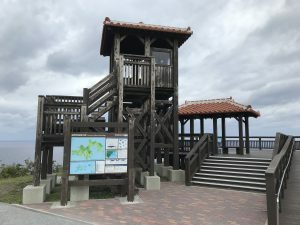 A local sits in the tower and looks out for whales and radios their position to the whale watching boats. Some humpback whales usually come to breed around Zamami. They are around from January to April. Since it was only the first of January, it didn’t look like they had arrived yet. On the bay side lookout I met a lady from the U.K. who is a teacher in Yamagata prefecture in the north and who escaped the snow there for some days of sunshine, only that there was no sunshine. But at least it was warmer than in Yamagata, which is drowning in snow this time of year. The lady was a muslim and wore a black veil. I wonder how the people in Yamagata react to her. I’m sure it’s not exactly easy for her to live in Japan. After the lookout tour I had been to everywhere on the island and it is very beautiful indeed. On my last full day I went to the pirate beach once more and to town for lunch, but then escaped back to the hotel due to rain becoming more constant. 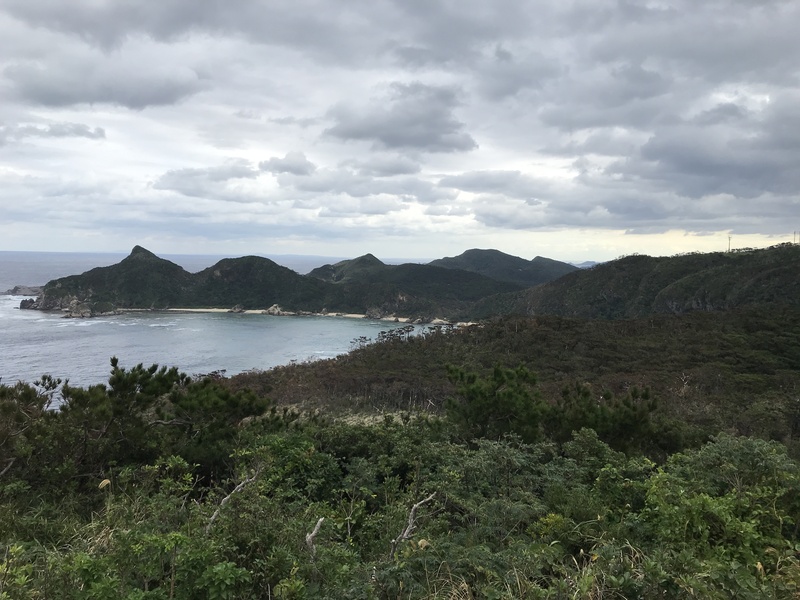 Despite the far from ideal weather and the difficulties in getting to the island, I thoroughly enjoyed my stay in Naha and Zamami. 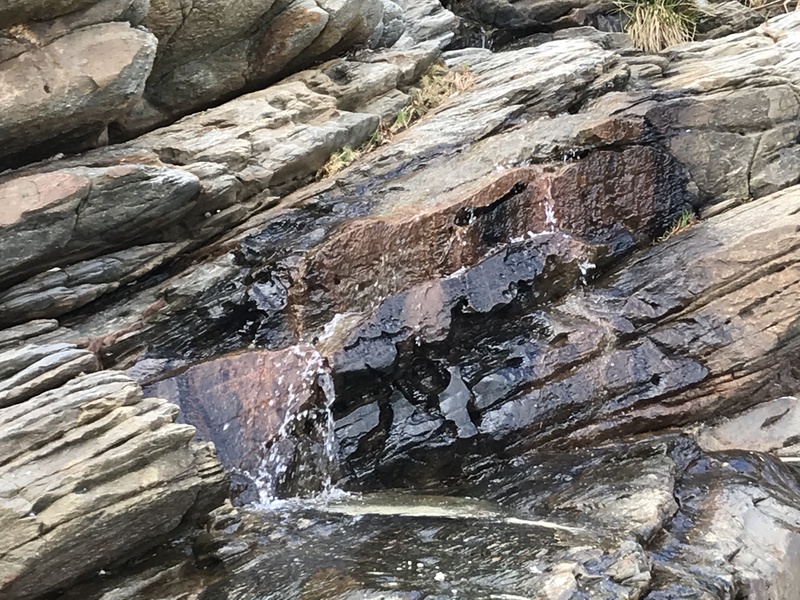 The latter is a great getaway from the hustle and bustle of city life. 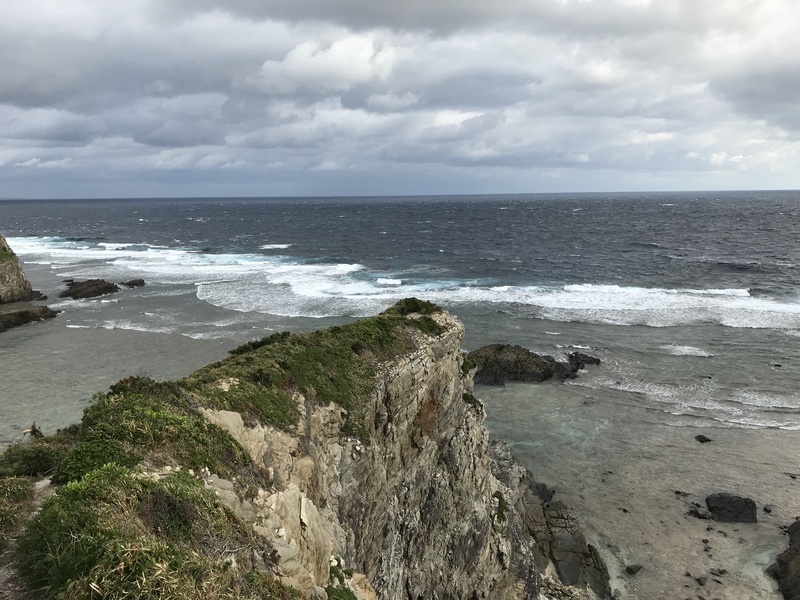 I admit that the ferry ride to Zamami was a bit scary, the boat was swaying nicely and bumping hard against the currents and the swell. But nothing happened and I got to Zamami all right. Hotel staff picked up not only me but another ten guests or so and brought us the two kilometers to the hotel by car. Zamami belongs to the Kerama island group, a collection of three inhabited islands and countless smaller and bigger rocks in between. Around 600 people live on Zamami, fewer on the other islands around it. 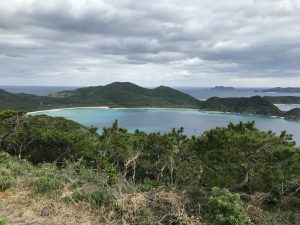 I quickly borrowed a bicycle with battery assist and started exploring the island. 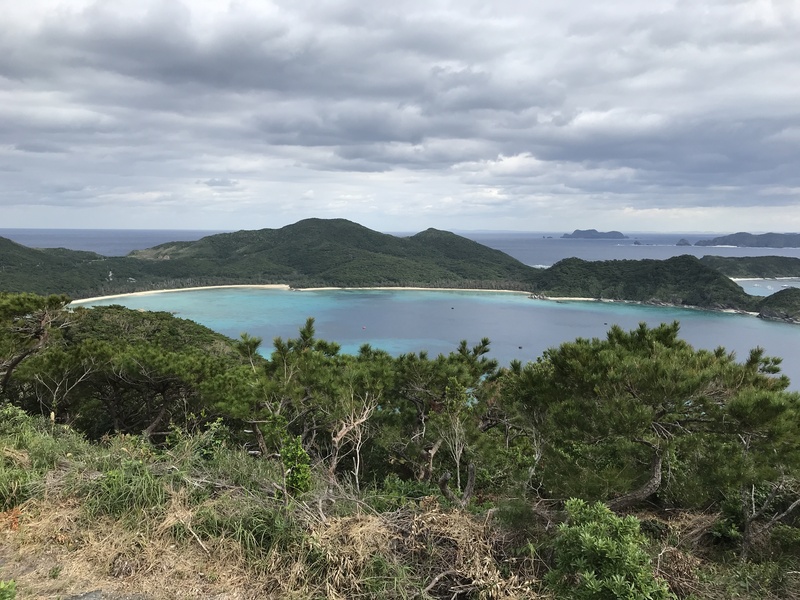 There is one traffic light on the island at the port and also that one is not really needed 😉 The things to do on Zamami are diving, snorkeling, swimming, fishing, whale watching and riding around with a bicycle. 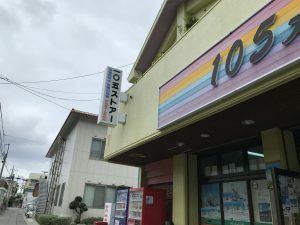 There is one general store in the main settlement with food and shampoo and the like, plus t-shirts and beach sandals and that’s basically it. I read about Pope Francis’s Christmas address, in which he said people should live simpler lives without accumulating mundane things. 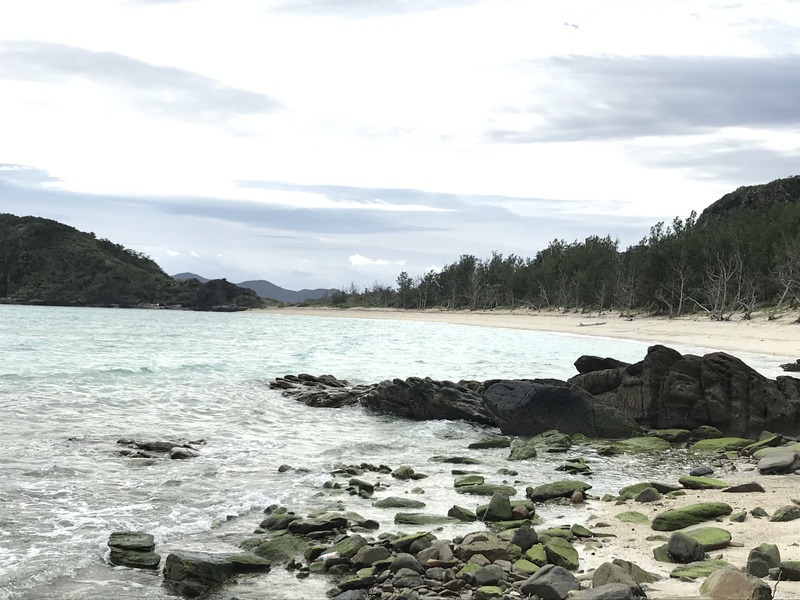 Come to a small island, there you can enjoy simpler life. On my first full day on the island I headed north of the last settlement where I was staying, and there is “nothing” anymore but “wilderness”. The wilderness is still very civilized with a well maintained road that leads first to another lookout over a cliff to the north. Then a long and windy road leads to the north-eastern end of the island and on the map it promised a beach. I’ve seen quite a couple of beaches in my life already, but this one is one of the best for sure. 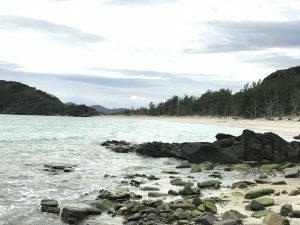 It has just the right size, a fantastic view to uninhabited islands and rocks in the distance, great sand and a very rare feature, a small fresh water booklet that comes down from the mountain behind it. Now where do you have a fresh water booklet coming onto a perfect beach? On the way back I rode down another path to the inner bay and came out at a cottage place, which probably only operates in summer, very nice getaway as well. 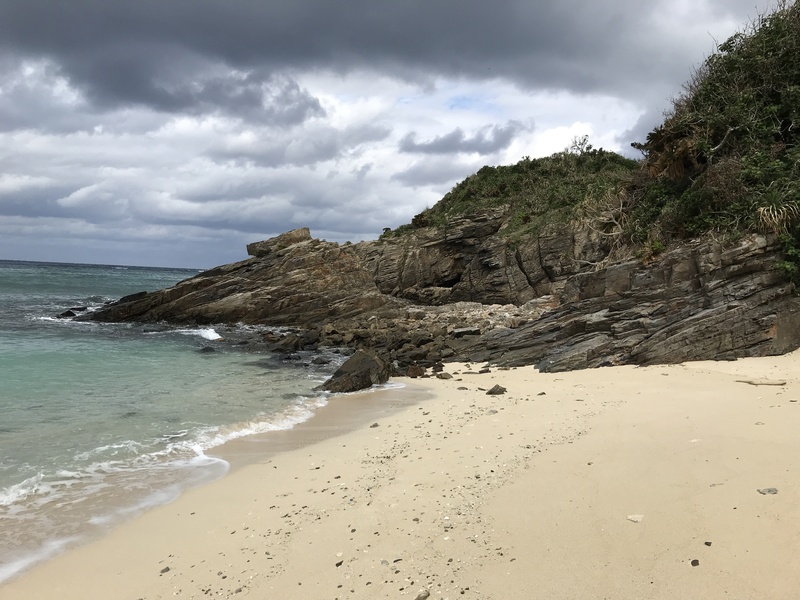 Then off to another pirate cove over the wider ridge behind my hotel, a north-west facing small beach. Zamami is a truly beautiful island with lonely beaches that I suppose are not full even in high season. 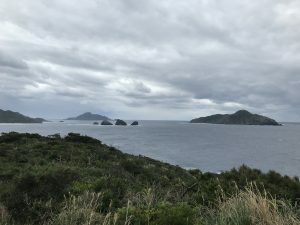 I got up at seven in the morning to be ready for the ferry, but… at eight came the announcement that also that day all ferries to Zamami were cancelled due to the bad weather and rough seas. Hmmmmm… since I liked my room and it’s price, I prolonged my stay for another night, despite the fire alarm disaster. So, what to do? 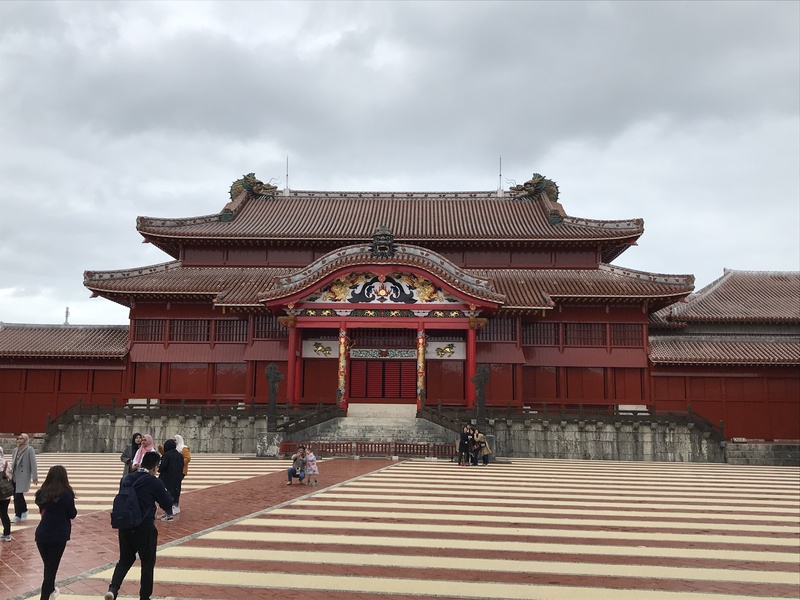 Well, when it comes to sightseeing in Naha, the castle is a must. Of course I had been there also in the 1990ties, but it was so long ago it was worth going again. 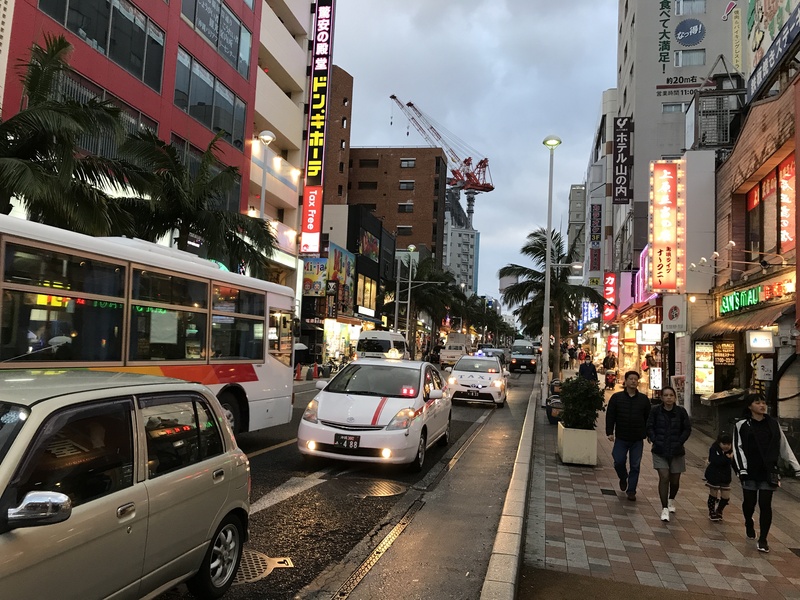 When I was in Naha in 1994 there had been only buses and lots of traffic jams. There are still traffic jams, but meanwhile Naha got a tiny monorail line that starts at the airport, goes through the middle of the city and stops at the rear of the castle. I rode the cute monorail and wandered through the castle garden to its front in a stop and go of showers. 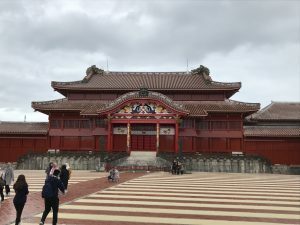 The castle is very Chinese, since the Ryukyu kingdom was, if independent, always intertwined with China as well as Japan. 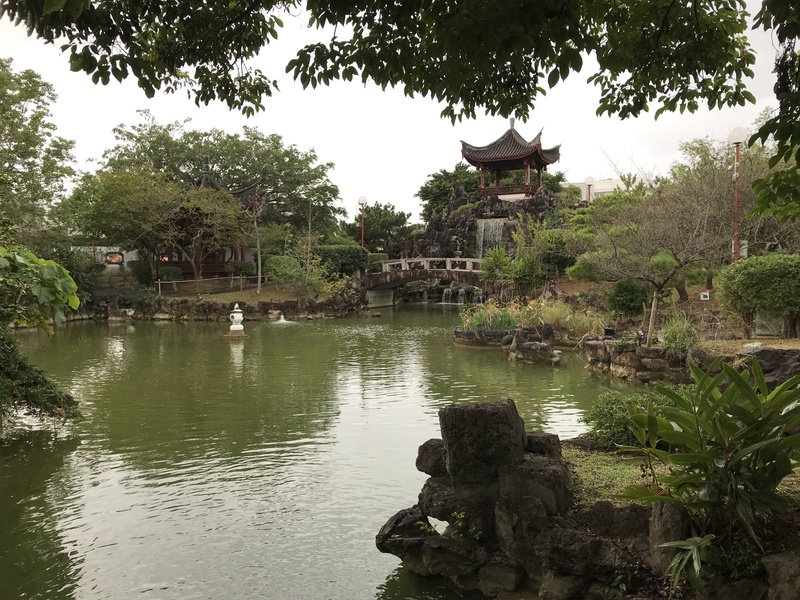 Ryukyu only became Okinawa around 1870. 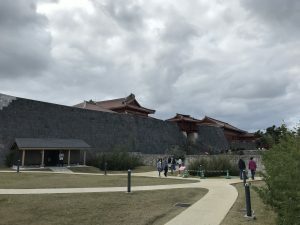 After the castle visit I wandered back towards the Kokusai Douri, but the march was too long and I caught a bus back to shopping paradise. Next I wandered on to the Fukushuen garden, a Chinese garden close to the sea and it’s very much worth the visit as well. 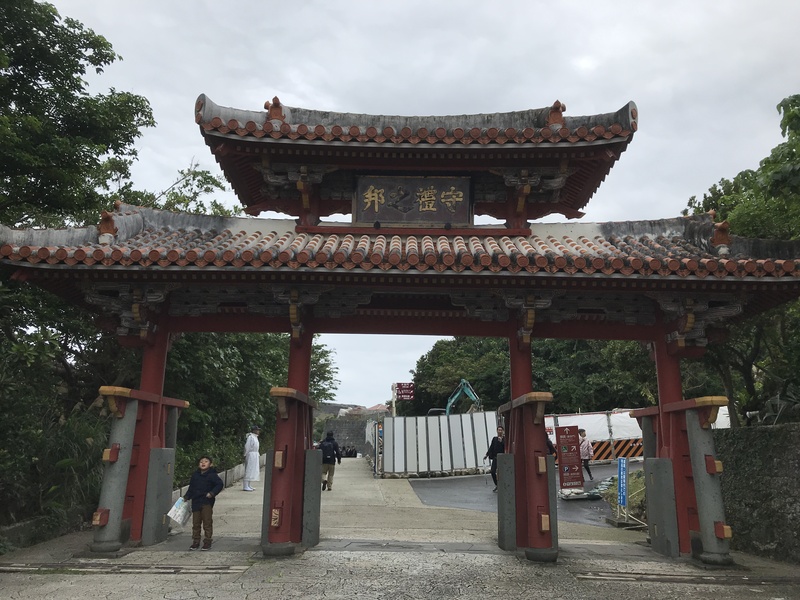 Finally, I went on to the main shrine of Naha by the ocean. It was already under preparation for the big queue and festival mode of the New Year shrine visit ritual, and it was interesting to see the little booths with food being installed everywhere. Finally, another march home and I guess I walked about 15 km that day and was pretty tired back in the hotel. Luckily no more fire alarms and at eight the next morning the good news, the ferry is going! It’s small island time at least once per year for me. So this time I wanted to go to the island of Zamami, about 50 km west of Okinawa’s biggest city of Naha, which is on Okinawa main island. There are three possibilities per day to get to the island, twice with a speed ferry, once with a slow ferry. 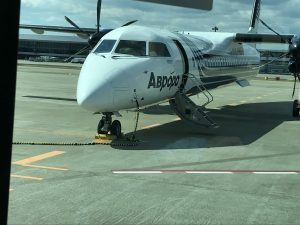 The only same day possibility was to take an early flight to Naha, then move to the port and take the afternoon speed ferry to Zamami. I arrived in clouds and rain and went by taxi to the port, but the taxi driver was already saying, probably the ferries don’t go, it’s too choppy out there. He was right, there was a sign at the ticket booth at the port saying, none of the ships had been going that day. Ugh… I quickly checked booking dot com and found a good priced hotel close to the port and the taxi driver brought me there. The hotel turned out to be quite new or renovated and the room was astonishingly nice for the last minute deal price. 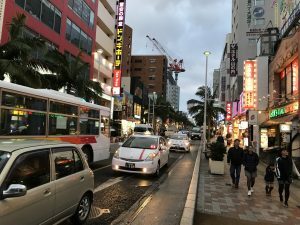 I had been in Naha once during my student times in Fukuoka a staggering 24 years ago. 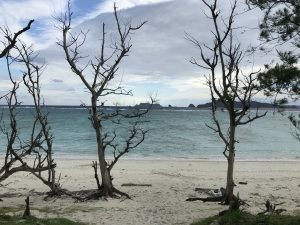 The other times I’ve been to Okinawa I only passed through Naha. Of course I hardly remembered the place. 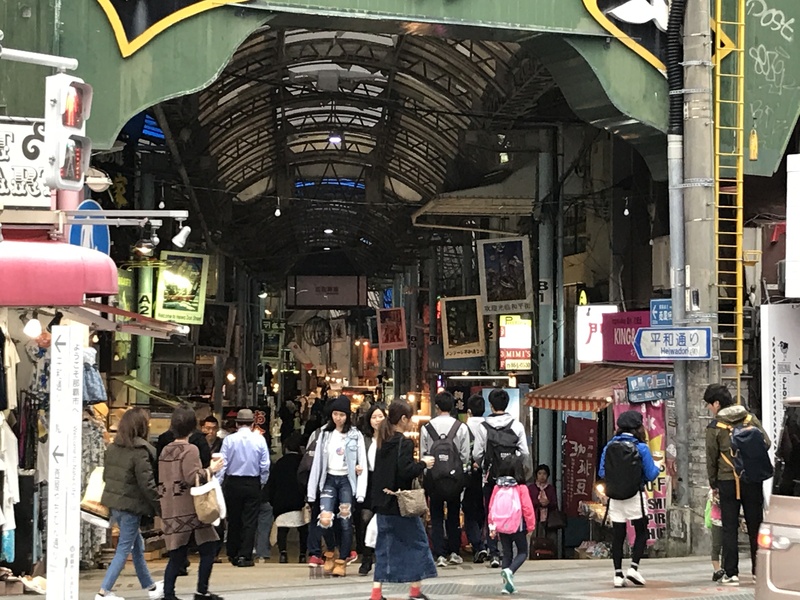 But the one place to go to is the Kokusai Douri, the International Street. It’s a pretty long shopping street and off it branch several shopping arcades as well. The one thing I remembered about Kokusai Douri was that there were dozens of what was then called “army surplus” stores. These shops sold old military uniforms and whatever other kind of military stuff. 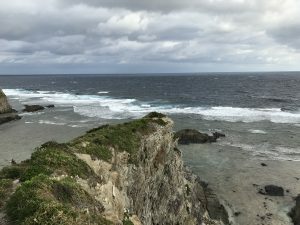 There is a large US army base in Okinawa, which the locals hate. The US gave back Okinawa to Japan only in 1972 by the way. These army surplus stores have all but disappeared. I found only one single lonely shop selling military clothes and gas masks and stuff like that. All the military shops were replaced with harmless souvenir shops selling tinker and food specialties. Well, I surely prefer that to the military crap. At 2:30 in the morning that night I was woken up by a nasty alarm on endless repeat: attention, a fire has broken out in the fifth floor, please evacuate the building immediately. 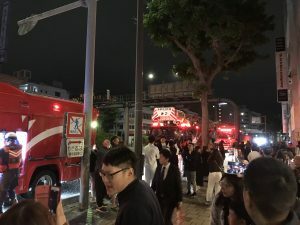 The recording was in Japanese and English with teeth grinding alarm sounds in between that were blasting your ears off. Since I saw nothing and smelled nothing, I was not very freaked out and took the time to put on socks, pants and two jackets before leaving the building with my purse and computer. Some hotel guests had been more freaked out than me and stood there in their pajamas freezing. It was raining again and windy at around fifteen Celsius. Three fire trucks and the police came in one mighty commotion. At 3:30 they called the alarm off. The very nervous night manager stood in the breakfast room and thanked the guests for their cooperation and that thanks to us the fire brigade could check everything so quickly and efficiently and sent everyone except for floor five back to bed. I was on floor four of the ten story building, luckily. No clue when the fifth floor was allowed to return. 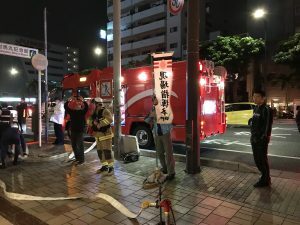 In the morning the front desk showed signs around that a guest had tampered with a fire extinguisher and the case was now investigated by the police. 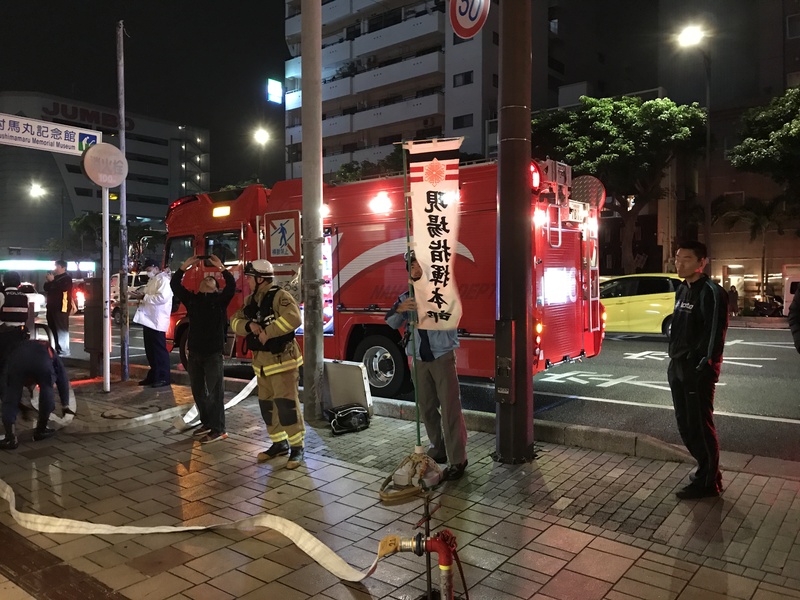 Oops 😉 seems like a drunken dude will not enjoy the rest of his stay in Naha. I’ve been going to the Yamaha music school for around thirteen years out of my eighteen in the greater Tokyo area. Maybe it was even fourteen years. I started out with drum lessons, which I picked up again after having gone to drum lessons in Germany for a while too. But, after two or three years, my drum teacher suddenly passed away. I think he got only around 65 years old. Next up were around seven years of vocal lessons. Last but not least, around four years of piano lessons. I just quit those piano lessons last Thursday and thus ended an era of some thirteen or fourteen years of music lessons. Wow, that’s been a long time. Why did I quit? I quit drum lessons because the teacher died of course, but I could have gone to another drum teacher. I didn’t because of lack of practice opportunity. Japanese houses (and German houses neither) aren’t exactly large or soundproof. Going to a studio for practice is costly and also time consuming. And now piano. Even though I have a keyboard at home and have the opportunity to practice putting the thing on low volume, the amount of practice needed to play like I imagine I want to play is so large that again lack of time is the killing factor. Writing takes the priority and I am not willing to sacrifice writing time for piano practice time. Another thing was that the music center I went to the past two years after moving to Yokohama, is a pain to get to (train ride into the opposite direction from home after work and fifteen minute walk from the station), which contributed to the lack of motivation to go. I just saw the Bohemian Rhapsody movie and it left me with this urge saying – when’s the next concert I’m going to? 😉 It will be only in two months when the Finnish melodic death metal act Wolfheart will come to Tokyo. When was the last concert I went to? That was German power metal band Primal Fear exactly one month ago. Before that I saw my new favorite band Insomnium, Finnish melodeath as well, in Switzerland. The Bohemian Rhapsody movie made me jittery – wanna bang my head and shout to bands I like or love! 😉 Music is one of the most powerful and wonderful things humans have invented. The energy music gives people is amazing. Music and also dance of course are much more let me call it “primeval” than reading books or looking at paintings, because they make you move. Well, not all music of course, sitting at a classical concert just listening is not very active. Such “passive” music does not appeal to me at all, I want stomping and shouting and head banging ;-). Music also brings like minded people together. It’s magic. It’s the same for books of course, you need to have a hell of a lot of downloads on Kindle to put bread onto the table. I cannot understand people who want things for free. Art, whatever art it is, gives us so much and people want it for free? If artists cannot survive by what they make with their art, then who does that help? There still seems to be this illusion out there that artists make shitloads of money. Some, very few, big names do, yes, but those people are maybe 0.1 or whatever percent of those who produce art, which is one of the greatest sources of energy and joy in our lives. I might be writing books, but music is the thing where I get most of my energy from and I’ll hella continue to support my favorite bands by paying for what they produce and I hope others will do so as well. Go out there and pay our artists! Thanks! I haven’t posted a book progress update in a while. So here is one. The fourth Dome of Souls novel is all but ready. It’s proofread, I have a cover, only thing I need to do is to format it and start the publishing process. Under my pseudonym, I also have a cover for the latest beast and it is ready and currently at the proofreader. Once I get it back, I have to make the final changes and then that one will be good to go too. So what’s keeping me from doing the final steps of the fourth Dome of Souls novel? The fifth one! 😉 I’m in the process of writing its first draft and it’s been going very smoothly and quickly and I’m already at 75,000 words. I expect the beast to have between 90,000 and 100,000 words in the end, so not much more to go. I’m pushing for the completion of the first draft to stay in the nice and steady creation flow it is in now. While Dome 3 = Jeronimo and Dome 4 = “title to be announced soon”, took a while to write, Dome 5 is like Dome 2 = The Anatomy of Anarchy, it practically wrote itself, because the story was all very clear in my head already. It was and is a great pleasure to be writing Dome 5 due to this “the book writes” itself aspect. I’m at it for seven weeks now and I suppose the first draft will be finished after ten weeks or so. That would be my second quickest time ever for finishing the first draft of a novel, the fastest being and probably remaining “To Mix and To Stir”, the second Hagen Patterson novel, which took me a mere five weeks to write. I’m always talking about the initial drafts here, the self-editing etc. process is so much longer than the first draft. “To Mix and To Stir” remains the fastest book also in the department of the overall process including self-editing, and editing/proofreading by someone else. To Mix and To Stir came out nine months after I started with the beast. Dome 4 will probably come out in January or February too, once I get around to formatting it 😉 Cheers! 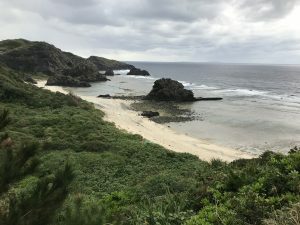 I am a Fantasy and Science Fiction writer who lives in Japan for more than ten years already and I cannot even fathom in which ways living in a foreign country for so long has influenced my writing. It's weird...I hope.